A tanner processed hides and skins into leather. The hair was scraped off after loosening with lime and sulphide; after this the skin was soaked in vegetable extracts such as oak bark. Once dry the hide was in a preserved state, which could then be passed on to curriers, who would soften it with oils, fats and waxes. The leather was then ready to be made into shoes, harness and leather goods. In 1525 John Prideaux, tanner, was in debt to Thomas Seymour; presumably the same John Predeax who was in debt to John Elyot of Charleton the following year. In a legal action concerning the market in 1630 between, amongst others, Thos. Prideaux and Thos. Ford*, Nicholas ffabyan of Ashburton, tanner, made a statement about the 'pillory, cage or prison house' and the stocks. *Quoted by J S Amery in his Presidential Address to the Devonshire Association. In 1615 Thomas Dolbere, tanner, was one of the defendants in proceedings in Star Chamber. The case, brought by Thomas Adiscott, involved the alleged suppression of a will, assault, theft and falsification of documents. See Wills, under People and Properties for a draft will of Thomas Harris of Ashburton, dated 26th June 1619. Named in it is his wife Johanna, his sons Barnard, Thomas and Nicholas, and daughters Johanna, Mary and Agnes. 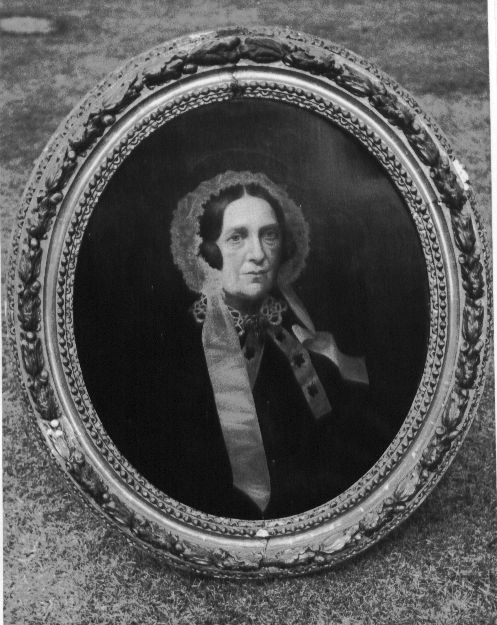 Agnes is the wife of George Knollings. 1624 Barnard Harris of Aishberton, tanner and Thomas Harris the younger, tanner, brother of Barnard were involved in a settlekment of a 'moiety of a great close of land called Chewley Park', where the consideration was £135. Ten years later a 'Declaration of the Uses of a Recovery'* was made concerning lands and meadows called Chewly Parke. Peter Gawde of Aishberton, tanner, John Ogier of Aishberton, blacksmith and Nicholas Harris of Aishberton, tanner, were involved. * As I understand it, this was where those involved in a land transaction colluded in a fake lawsuit to ensure that the land was free from restrictions imposed by wills, settlements etc. 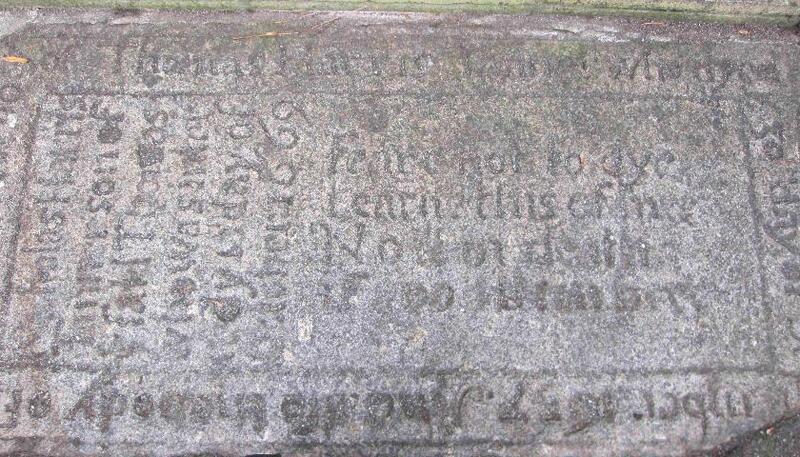 The epitaph is in fact on a granite slab outside the church, on the ground in front of the West door. Thomas Harris died on September 30th 1637, and his son, Nicholas, who is also commemorated, died on 10th October 1669. Right and below: The memorial slab to Thomas Harris, tanner, and his son Nicholas, tanner. The will of Nicholas Harris, tanner of Aishberton, was proved in the court of the Dean and Chapter of Exeter in 1670. He left messuages in North Streete and East Streete and 3 closes of land called Longabrendon. He left a will dated 24th July 1690, in which Peter Fabyan the younger is mentioned. 1717 'A petition of the tanners, leather-dressers and cutters of leather, in the town and borough of Tot_ness as also of the town and borough of Ashburton, both in Devon, on behalf of themselves and others was presented to the House and read; setting forth that vast quantities of oak-bark had been exported from this part of the kingdom into Ireland, where there is no duty on hides, to the great discouragement of the petitioners; and for the better preventing the gathing of hides and skins in the flaying, a law was made against the same; but the forfeitures therein are so inconsiderable that it is in a manner ineffectual; and by another statute, the engrossing of oaken bark to fell again is forbid; but by the art of some people those laws are made of no effect: and praying the the exportation of bark may be prohibited. 1748. At the Court Leet and Baron the searchers and Sealers of Leather in 1748 presented William Hern for 'Selling of leather unsearched and unsealed', an offence which he was to repeat in 1751 and 1762. In 1750 Jno Teddey, his son Thomas Teddey and Philip Bennett were also presented at court for 'Washing skins above the town' - they may have been tanners. 1760 Amongst the bastardly bonds held in the accounts of the overseers of the St Thomas Union is one concerning Ann Coles and William Herne, tanner. Both were from Ashburton. November 5th 1795 'A method of tanning leather without oak-bark, discovered and proved by William White, tanner, of Ashburton, Devon. 8 tanners and dressers of leather added their support - many are local names, but they may not have been from Ashburton: William Herr; John Windeatt; George Ley; Tho. Bickford; Edward Langman; Richard Maye; William Bickford; William Batten. 1810 Amongst the bankrupts listed in the Bristol Mirror was John Ellis of Ashburton, tanner. Lavington Evans was born in June 1785, and baptised in the Presbyterian faith in July of the same year, in Ottery St Mary. He was the son of William Burd Evans and his wife Sarah. According to research by the late Robin Morley Fletcher, Lavington Evans had been apprenticed to a Mr Bickford, possibly William Bickford above, and later bought Mr Bickford's tannery business. During a difficult time in the tannery business, he opened a successful drapery business. Lavington Evans had been apprenticed to William Bickford, a linen draper, in 1801. Bristol Record Office holds an 1813 marriage settlement concerning Lavington Evans, tanner of Ashburton, who is betrothed to Mary Sparke, also of Ashburton. Pigot's Directory 1822-23 lists 4 tanners in Ashburton: Lavington Evans in North Street, John Higgins in St Lawrence Street, John Vere Mann in East Street and John Rendle at Old Mill. White's Directory of Devonshire in 1850 shows Evans, Lavingtn, as a tanner in Lawrence Street, Ashburton. In the 1851 census Lavington and Mary Evans are living in West Street with their 3 adult children. 60 year old Lavington is a tanner, employing 12 men, 2 boys and 1 woman. His 23 year old son James is a draper employing one assistant, and his son Jonathan, 20, is a tanner. 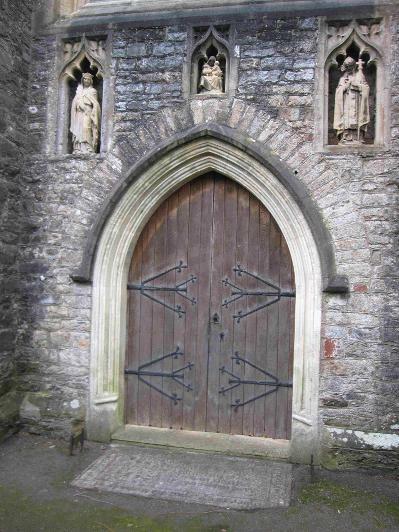 All the family were born in Ashburton apart from Lavington, who was born at Ottery St Mary. Another son, David Parker Evans, was in Stanford Dingley at the time of the 1851 census, with his wife and daughters, and also a sister and brother. 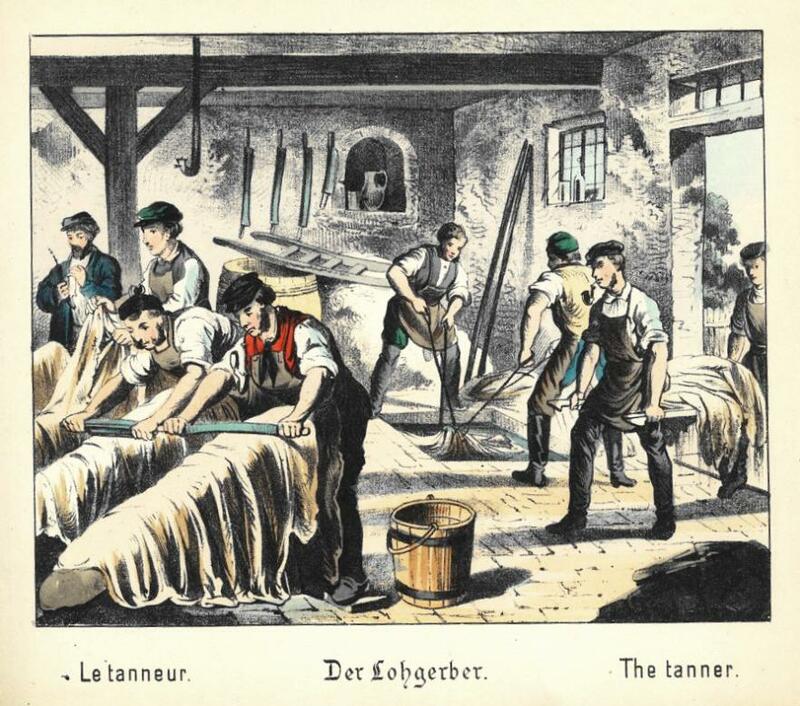 David was a master tanner employing 19 labourers. Robin Morley Fletcher's research (see above) also indicated that Lavington Evans was involved in the firm of May, Evans and May in Hungerford, and in P and S Evans and Co., Avonside Tannery, Bristol. Slater's Directory lists May, Evans and May as tanners at Charnam Street, Hungerford. James Sparke Evans was born in 1824, and Peter Fabyan Sparke Evans in 1826, both the sons of Lavington Evans and his wife Mary. In 1855 a foundation stone was laid at Beer for a new 'sanctuary for God'. Samuel Evans of Ottery St Mary laid the stone, and Lavington Evans of Ashburton made one of the addresses in the evening. By 1861 Lavington Evans and his family are living at Charlotte St., Bristol, and Lavington is retired. Right: Mary Evans, née Sparke, the wife of Lavington Evans. Left: Robin Morley Fletcher says that a portrait of Lavington Evans was presented to Ashburton Chapel by his son, Jonathan Lavington Evans of Bristol. The portrait was unveiled by PFS Amery, JP. 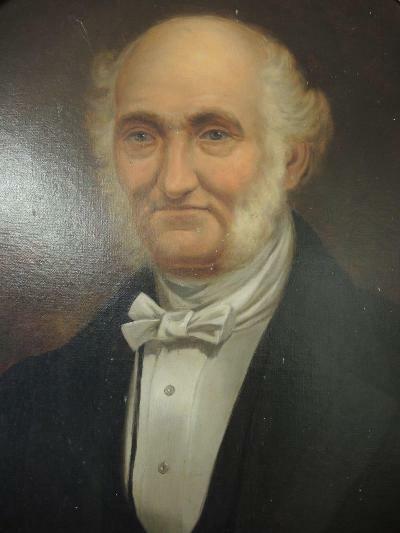 The portrait is now in Ashburton Museum (not on display because of damage), and an inscription reads "1785 Lavington Evans 1864 for nearly 50 years Member and Deacon of this Church. He was the owner of a tannery situated at the rear of St Lawrence Lane." Photograph by Bob Heath. Many thanks to Bob and to Ashburton Museum for the image and information. In 1827 the Exeter Alfred reported 'A destructive fire' at Ashburton. It started in Mr Caunter's factory - the whole building and stock was lost, together with a dwelling house alongside. Mr Mann's tan-yard and part of Mr Hern's tan-yard were also destroyed - a total of £12,000 damage. The tithe apportionment map for Ashburton (1836 onwards) shows a tanyard at Chuleigh, and in plot 1618, close to St Andrew's Church (probably - the map is damaged). James Parker Evans, a tanner of Ashburton, gave evidence in the trial of William Barnes, accused of stealing wool. Later that month Mr Edward Sawdye was advertising a peremptory sale by auction, by the direction of the assignees and mortgagees of the estate of Mr John Rendell. The premises were the Old Mill, and consisted of a tan-yard, drying lofts, a bark barn, sheds, a dwelling house and 5 nearby cottages. 300 hides could be dried in the drying lofts, and the bark barn could hold 100 tons of bark. The house had two parlours, two kitchens and eight bedrooms, and there was nearby stabling for 14 horses. In 1851 John Rendell, tanner, is one of many occupants of premises called Old Mill. It lies between Chuley House and the Old Totnes Road. Mr Evans, tanner, was selling two bark mills in 1854, one of them with a poweful horse pump. He was also selling two stoves, with pipes for drying leather. 1856 Mr Pinsent Ware of Kingsteignton was letting a tan-yard in Ashburton. Called Old Mill, it had a dwelling house, drying loft, bark barn and water pit. It had 5 lime and 83 tan pits under cover. 800 hides could be dried in the drying loft, and the lifting pumps had a constant supply of water. The 1861 census shows 84 year old Christopher Benton as formerly a tanner. William Whiddon is a tanner, and John Bowden a tanner's labourer. Elizabeth Rendell is a tanner's widow. William Whiddon is one of a large number of people living in Browses Buildings - which appear to be in the vicinity of Bowling Green and Heavyhead Lane. On the same census Joseph Aggett is a master currier living in East Street. 75 year old James Doil is a currier lodging in West Street. In 1864 Mr Aggett, of Ashburton, was selling his currier and leather cutter's business. He advertised commodious premises at a reasonable rent. He had been in business for 23 years. *However tanning was still going on after this date - see items below. A note in Indigo in the Arab World says that the author had a conversation with Wilf Joint of Ashburton in the 1990s, where Wilf remembered dog turds being used by leather tanners.